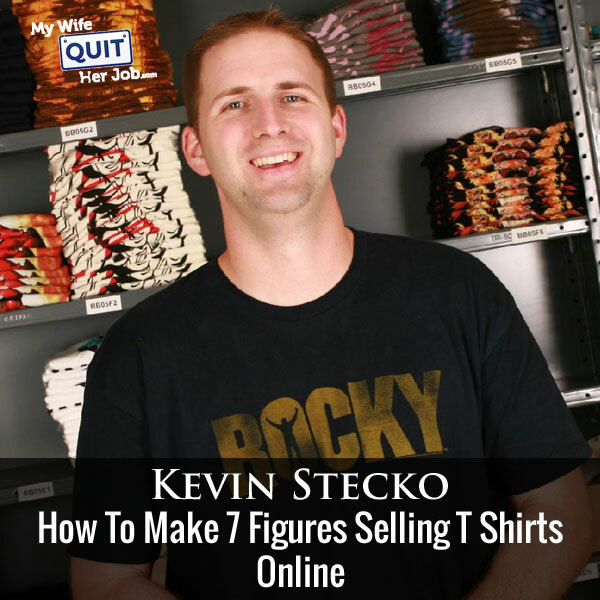 Kevin Stecko is someone who I met at an ecommerce mastermind retreat earlier in the year. And as luck would have it, I got stuck on a ski lift with the guy and we were forced to chat. Anyway, Kevin runs an awesome site called 80stees.com where he sells tshirts from the 80s. I was on the site the other day and it brought back memories of youth. Kevin is one of the very few t-shirt vendors that I know who have been in business for a very long time. Enjoy the episode! Kevin’s motivations for starting this business. Should you carry inventory or print on demand? How the licensing process works and is it worth it? How to rank in search for ridiculous keyword terms. Steve: Welcome back to another episode of the My Wife Quit her Job Podcast, the place where I bring on successful bootstrapped business owners and delve deeply into what strategies are working and what strategies are not with their businesses. I’m Steve Chou, and today we are talking with my buddy Kevin Stecko, the founder of 80stees.com. Now in this episode you’ll learn the keys to running a successful e-commerce store selling t-shirts online. Now before we begin I want to give a shout out to sitelock.com for being a sponsor of the show. Now if you owned a brick and mortar business, you’d secure it, right? Alarms, cameras, the whole deal, and as an online business you may not think about security as much, but you should, because your customers are. And did you know that one third of consumers hesitate to purchase online due to security concerns. Protect your business and your customers with SiteLock website security. They offer malware scanning and removal and industry leading web application firewall and more. SiteLock acts as your personal security team. Now visit sitelock.com/mywifequitherjob for more information and get your first three months free. Once again that’s sitelock.com/mywifequitherjob. If you want to learn how to start your own online business, be sure to sign up for my free six day mini course where I show you how my wife and I managed to make over 100K in profit in our first year of business. So go to Mywifequitherjob.com, sign up right there on the front page, and I’ll send you the mini course right away via email. Now onto the show. Steve: Welcome to the My Wife Quit Her Job podcast, today I’m thrilled to have Kevin Stecko on the show. Now Kevin is someone who I met at e-commerce mastermind retreat early in the year, and as luck would have it I got stuck on a skid lift with the guy and we were forced to chat. Anyways Kevin runs an awesome site called 80stees.com, where he sells t-shirts from the 80s. And I was actually on the site the other day, and it brought back memories of when I was younger. I used to watch Robotech when I was a kid, and just out of whim I decided to search for Robotech t-shirts, and I was pleasantly surprised to find them there, so how cool is that? However when I pointed out to my wife that I was going to pick these t-shirts, I’m going to wear them, she started shaking her head. Anyways Kevin is one of these very few t-shirt vendors or store owners that I know who have doing this for a very long time. And if you remember back in episode 122 when I had Derek Pankaew talk about his t-shirt business on Teespring, well Kevin’s business model is entirely different, and in my opinion is a lot more sustainable. And with that welcome to the show Kevin, how are you doing today man? Kevin: I’m doing great, thanks for having me Steve, and I think we have to change the name to my wife is now allowed to give me clothing advice instead of my wife quit her job. Steve: Actually I was also looking for this t-shirt, there is like this like obscure cartoon I used to watch when I was a kid, it was called Pandemonium. It only had like 10 episodes total. If I had a t-shirt like that I would totally wear that. Kevin: Pandemonium, I’ll have to check it out, but it doesn’t even ring a bell for me. Steve: You probably don’t even remember that cartoon; it only lasted one season, a bunch of [inaudible 00:03:30]. Kevin: I think you might have mentioned that on the skid lift. Steve: Oh still talking about that ha, yeah. So Kev, I’m curious how did you come up with selling t-shirts, it’s like a really hard saturated business model? Kevin: Right, well actually when I started it was not at all, so it kind of goes back to my college days. There was this little, I guess you might call it a hedge shop in a back alley that I used to walk by to go to class, and they would always have these boot leg t-shirts in the window. I actually didn’t even know what boot leg meant at the time, but he had a hellion t-shirt and I was like that’s me, I’m getting it. So I wore it around campus and because everyone else at school also sees the same store all the time, no one ever asked me about it or thought it was special in any way. But when I went home for the summer, I went to the amusement park and like 6 different people came up to me and asked me where I got it, and this was in 1999, summer of 1999. At that point I just had this kind of an idea, and I graduated in December of 99, and basically took a deal with this guy to buy in bulk from him. I wasn’t even really getting a good deal, but I know I used to make a [inaudible 00:04:50], then I went to Penn State and tried to indoctrinate all of the students in to their software, he gave us free copies of like office to full suite, and so I was able to use Frontpage to create a website. Steve: And did you sell that initial lot right away? Kevin: Yeah, and it really wasn’t that many, I mean I had really no money except for just whatever I was able to make part time, so I might have had like 20 shirts that I bought, I think I was paying 13 each. So it wasn’t even cheap, and basically those sold out really quick, yeah. Steve: So Frontpage didn’t have e-commerce features back then, right? How were you collecting money, just curious? Kevin: The very first version of the site, it was like eBay in its infancy but less convenient. Basically people would fill out a form that I would get emailed to me, then I would send them instructions on how to mail me a check. Steve: Oh wow okay, amazing and you sold 20 t-shirts. Were those t-shirts boot legged? Kevin: They were, and like I said at the time I didn’t know, and they even had low trade mark thing that would indicate that they weren’t, but as I got into the business further I found out there are companies – those were pretty well known Bootlegger. Steve: Okay, so how did that evolve into 80stees? Kevin: So my email – I’m sorry my eBay username was 80stees, because it was him and he showed and then I bought like transformers and thunder cuts. I was just basically like well I want to have sort of a theme here, and I was totally an 80s kid, and that basically was like well I’ll do what I loved as a kid as a theme for the tees. So I launched on eBay, and then had like a not even a real domain name, it was 80stees.hypermark.com, there was a free Frontpage host, and then March of 2000 I registered the domain 80stees. Steve: Okay, and then what was your first platform then? Kevin: So it was literally Frontpage, and then it kind of evolved. There was a gold rush in late 1990s for all these free software services, and one of them was an ecommerce platform called bigstep.com. And so I had the most hacked together thing you could imagine which was using my Frontpage site which ranked well for search terms, and then I would link to this BigStep cart, then I would link back to the Frontpage site. So it was literally like going cross domain from one site to another, but it ended up working, we sold pretty well on there. Steve: Interesting, so what are you on today? Kevin: Today we’re on Shopify. Steve: Okay, and so was it from BigStep to Shopify or there was a bunch of carts in between there? Kevin: Yeah there was some carts in between. There was something called Storefront 5.0. Kevin: And that was dot SP platform, and we ended up actually using that for a long time and modifying it extremely to the point where you wouldn’t recognize it, and then we actually got hacked when we were on that platform. I then switched to a company which due to a legal agreement I’m not allowed to mention, because they completely underperformed, under delivered, and then from there we were on Shopify. Steve: Okay, just so you guys know who listening out there, Kevin has been doing this for a long time. I would say almost 20 years. Kevin: Yeah, I’m getting close. Steve: 16years, 17 years yeah. So I’m just a little curious about your t-shirt business, so do you stock your t-shirts, or do you print them on demand. Steve: You stock, okay. So that actually opens up a can of worms, so first of all why did you decide to stock that versus just printing on demand with I guess this – I don’t know [inaudible 00:08:53]? Kevin: Okay yeah so at the time really I was selling licensed t-shirts and I wanted to do it the legit way. So there were a few companies, I think there was only a company like Slapon or something like that that were doing heat [ph] transfers, but for the most part you had to go the sole screening out. There was no such thing as like a direct government print, so it was pretty much based on — the business model was based on what I had to do in order to offer licensed products. Steve: I see, so you can’t — I know there is places at the mall where you pick what you want on the show, and then they just press it on right in front of you. Kevin: Yeah, those are almost guaranteed boot legs. Steve: Like if it’s like a sports team? Kevin: Oh yeah 100%. And the reason that is, is because these are [inaudible 00:09:48] wants complete control of the final product, and if they sell an officially licensed heat transfer, you could put it on whenever, and they lose complete control at that point. Steve: Interesting wow, so in the mall, so they can get away with it, so does that imply that it’s not really policed that heavily or? Kevin: Yeah, I think that if they’re getting real with it either it’s generic enough that’s it’s actually not infringing or yeah they’re just not – they haven’t been caught. Steve: Okay, so does that imply – so everything that you sell today is all licensed, right? Kevin: Yeah, I mean it’s like 99.9%, there’s a few things that just didn’t need a license. Steve: No, no finish your sentence. Kevin: I was going to say to obtain all those licenses though for one company would be extremely expensive. Steve: Yeah, I was just going to ask that, so what’s the process for obtaining a license, how much does it cost and what are the terms of a deal? Kevin: It all depends in terms of the costs, so like if you’re talking Star Wars, like which would be the big banner industry, you’re talking hundreds of thousands of dollars that you would have to guarantee and potentially even hundreds of thousands that you would have to pay upfront towards the guarantee. Steve: No way, because you guys sell a bunch of Star Wars shirts and they are all licensed, so does that imply that you’re paying six figures? Kevin: No, that implies we buy from companies that have done that. Steve: Okay, all right got, got it, okay. Kevin: So we use some control on that aspect, but the good news is we do move a significant volume, so we have vendors that work with us to get us exclusive designs, and so really it’s actually beneficial for us now to have a license in a lot of ways, we don’t have any of that in this sort of overhead. Steve: Do you have any licenses where you have like full rights to print stuff? Kevin: Yeah, we do, and there is really no such thing as full rights, so every design has to be concept approved by the brand, and then they have to sample approvals and production approvals. You’re still limited to what they’re going to say is okay, it’s like you wouldn’t be able to put on like a swear word on a transformer shirt or something like that. Kevin: In terms of what the shirt shows a typical license deal is you have a time which will just be the length of time that you’re allowed to sell a product. You have the properties, which just clearly defines what properties are on the case like we have Hasbro license, so it defines like transformers 1980 style guide type thing. So like I couldn’t make the new movies that come out t-shirts, I can only do the 1980 stuff. It also defines the loyalty percentage, the payment terms on that and the territory, so like United States, UK, online, that type of thing. Steve: What does the loyalty look like? Steve: Sure, I was just trying to get a range, so 10 to something percent. Is there an upfront fee also? Kevin: Yeah, it’s not a separate fee from the loyalty, but what it is, is it’s a guarantee towards the loyalty, so like if it’s say that I said I was going to pay – I was guaranteeing at a cost to you or said I’ll pay $10,000 in loyalty. Some companies in order to take you seriously might want to all that 10,000 upfront. Kevin: But then after you pay that off, so let’s say you had a really good first year and you sold $100,000 worth of stuff at a 10% loyalty, so that whole first year you’re not actually sending them a check. You’re just banking that money you’ve already paid them, and doing the accounting later, okay well we owe you $3000 loyalties this quarter, but we already paid you 10, so now we owe you 7. Steve: I see, so everything is negotiable it sounds like? Kevin: Yeah, it all depends too on the property. The bigger the property the less negotiating room and the knowledge of the structure is going to be. Throughout we do have a Robotech license actually. Kevin: Those guys are – it’s a fairly less structured deal compared to others, and I think that’s primarily because that’s their only property, and they don’t have like a huge team, whereas Hasbro is a public company, and they’ve got a huge licensing team and so everything works a certain way. Steve: So over there contracts are too expensive like Star Wars you mentioned you buy the t-shirts from a vendor who has a license, and what are the margins on something like that like when you buy shirts from someone else? Steve: So what does DTG stand for? Kevin: DTG is direct to garment, so it’s like literally like an Intel printer for t-shirts, and a new mess in Teesprings for like – Teespring originally was also screened and there always like a fairly high minimum, and now they actually spot the DTG model, so you can really sell one t-shirt via Teespring with that DTG method. But yeah, so I mean we try to maintain margins of about 60%, but that can get better for instance let’s say we’re able to buy 600 pieces or 1200 pieces, then we start getting a little bit of discount on our products. Steve: Okay and then you have to stock all these? Kevin: Yeah we try to avoid the pain of stocking to an extent with the crowd fund model that is very similar to what Teespring does which is basically it’s a fancy pre-order. Steve: So how do you make the decision on whether to stock something, whether to license something or whether to crowd fund something? Kevin: Okay, so these are a little different things, so we pretty much bring everything in the stock to ship eventually. So I guess if we take it one piece at a time – if I were to say how do I start the licensing? It would really be a situation where it’s either a huge strategic advantage for us to license it, because no one else is going to do what we’re going to do with it, or going to be able to do it. So like for instance Robotech, no one else had a Robotech license at the time, and it just made a whole lot of sense for us to be deep placed to go for Robotech t-shirts even though it’s a fairly small fun base. Kevin: Now Hasbro, I got the license in 2007 and now it’s because at the time our vendor for transformers t-shirts was letting the license expire, and there wasn’t anyone else who was going to pick it up immediately, and as you might imagine for a company called 80stees that’s also had a cartoon t-shirts we needed transformers t-shirts. Kevin: So that was a situation where I was I’ll find – I’m really looking at potentially not having a huge important part of my catalogue. Steve: Okay, and when you have the license, you’re printing these shirts on demand. Do you do those in Asia or do you those in-house? Kevin: We don’t do a whole lot of on demand; we’re just actually just starting to work with a partner company now. We do domestic printing for all of our stuff though. Steve: And the reason for that is just control? Kevin: Yeah, by the time you’d get something printed in China and bring it over, I don’t think it’s that – it’s going to be that big of a cost savings based on freight and everything. It’s just so relatively inexpensive. Steve: Okay, so I think can we talk a little bit about this crowd funding that you do? Steve: How does it work? Kevin: Okay so yeah we were inspired by all these guys that were showing up on Facebook, and saying, “Hey there is three days left and we have to hit a minimum of 60 shirts or this design won’t get printed,” and that was literally pioneered by Teespring. The reason that they did it that way is because of the print minimums, so they wre only doing self screening and literally it wasn’t worth any one’s time or money to take an order for five t-shirts. So these sellers had to get a minimum quantity, and so they built their page to basically become a campaign for a certain amount of shirts or a minimum amount of shirts for a limited time. It just had all these nice social signals to it where people kind of feel part of something; it’s similar to kick starter in a way, right? Kevin: You’re part of something bigger than just buying a product, and having the time limited is always nice because that gives the urgency. I love the book the Psychology of Persuasion. Kevin: Yeah exactly, it basically in one ecommerce page you hit quite a few where he talks about are the most persuasive things to do for selling. So we’ve said well we can do this type of thing, and what we do is we put the design up, we set a minimum, we set a time limit, and then as we watch for people to take a chance, because literally we might not make it if we don’t hit a minimum, we give them a discount for placing the order during that time period. Steve: Okay, so literally is a kick starter pretty much? Steve: And this is all hosted on your site? Steve: Okay is that a large percentage of your business? Kevin: No, I mean, I guess it is in terms of the number of products like we have thousands of products but only 20 to 40 on crowd for any given time. So I guess like those 20 to 40 do make up a decent number of sales relative to the size of the catalog entirely. Steve: How do you decide what to crowd fund? Kevin: You know it’s really just most new products nowadays. I have learnt that products that I think are awesome aren’t always awesome, and sometimes products that I don’t think are awesome, people think are awesome. So it’s just been a situation where well we put it put there and see how it works, and we really minimize our inventory risk that way. Steve: Let’s talk about that a little bit, because there is obviously even if you’re just selling transformers, there is a like a bajillion varieties of transformer t-shirts, right? So how do you test to see which ones are going to sell, do you just buy a bunch and then just sell them out there? Kevin: Yeah, I mean we always have like a hypothesis of we need new transformer shirts, so what character haven’t we not done in a while or what are we missing? And then we make the design, we get it approved and then we put it out there, and then literally the crowd tells us whether it’s good or not. Steve: How much is like your first run during a test? Kevin: You mean how many do we have to order or how many do I have to print? Steve: Yeah how many do you order, so not talking about crowd funding for a second, like let’s say you just put up a shirt on your site, how many do you order for that initial run just for testing purposes? Steve: Oh I see, okay. Kevin: So if we just list the product without a crowd fund, chances are we can buy it direct to garment and we literally might only buy like 1 or two pieces of each size, and chances are we’ve pre-sold it before we even got it. Steve: I see okay, so you do it in a way that it’s very little upfront monetary risk? Kevin: Yeah and we might say, like let’s say we have a design that we sold, I don’t know we might have set a minimum of 30 pieces because we want to at least know that it works and maybe our pre minimum was 144 pieces, but let’s say like it was a home run and we sold 300 of them or 600 of them or something like that. At that point then now we start thinking, well do we want to get a little more aggressive with how many we order to hit a price discount from our vendor. So it’s literally every single product is a decision unto itself as to how many we’re going to buy. Steve: What is considered a dud versus a home run? Steve: Within like a month you mean or? Kevin: Yeah, and then a dud of like chips which is a new license one of our vendors just got and we have no idea if we will sell any, like so literally we probably have to sell zero to give up on that entirely. Part of the reason for that too is because we don’t have that fan base to email out and say, “Hey you bought this other chip shirt,” so you have to start from somewhere, so like that’s which we had a bit of the audience over time. Steve: So yeah, let’s talk about advertising next, because in your case it doesn’t sound too bad to advertise, but in general marketing t-shirts can be really difficult because competition is so tough. So what are the channels that work the best for you? Kevin: Yeah I mean it can be brutal. Pretty much we spend our money on email marketing, on Google AdWords and Bing to arrest matters as you said and on Facebook. Steve: Okay, and so can we talk a little about each. So if you are on AdWords, are you doing Google shopping, are you doing just regular AdWords? Kevin: Yeah so our AdWords are in a bit in a state of flax right now, but I mean shopping is one of the budget. Kevin: Yeah, that’s historically – I think we may be pull some stuff based on inventory availability, so that’s one of the problems of stocking products is you might end up with like your most popular sizes out of stock at a point in time. So I think we might pull some stuff out like that, but we’re actually working with a new vendor, and we’re going to try and really tweak the shopping out. I’ll be honest with you we haven’t been doing it very well, and just from looking at the competition they aren’t doing it well either. Steve: Okay, but it’s mainly been shopping, do you guys do any display ads for Google or? Kevin: We tried in the past with very limited success. Steve: Okay, yeah that one tends to be a lot harder. I would think that Facebook would work really well for you, like I would be like your prime customer if I wasn’t married. Steve: Can we talk about one that has worked for you? Kevin: I’m sorry what’s that? Steve: Can we just talk about a Facebook campaign that has worked for you in the past? Kevin: Yeah, let me think of one specifically, yeah a specific campaign that has worked for us. Well I guess I can talk about maybe a more general, because that’s kind of our secret sauce is we’re not putting all of our eggs in one basket, where a lot of times it’s spending a few dollars a day advertising like the crowd funds, and just really being – how do I say this, like not passive but the opposite of aggressive with our bidding. So like we’re going to – and budgeting, so we’re going to say, okay maybe we’re only going to spend 10, 20 bucks a day advertising as our daily budget for a particular product. That way we can – I guess the way we’re doing is we’re not – how am I going to say this, it’s kind of hard to describe I guess. But by being more conservative with our bids, we’re getting hopefully the crème of the cup, and the most targeted people, because we’re not saying Facebook we want you to spend a whole lot of money. We’re saying, hey we want you spend just a little bit of money, and here is our awesome prospect that we describe for your targeting and everything, and then hopefully they give us the crème of the cup that way. Steve: So that implies that you are bidding by click then? Steve: Interesting, okay because then you can’t really control your bid, right? Kevin: Yeah, we control it via the budget more so. Steve: The budget, okay. And do you typically only run ads for crowd funding campaigns? Kevin: Yeah, that’s the majority of it just because we do have those social signals on the pages there, but we haven’t tried to do some more collection based ads just because we really want to spread ourselves around the entire catalog as opposed to just in the new products. Steve: Because I would imagine that’s like a lot of ads that you would have to manage, right? Kevin: It is yeah, so that’s definitely one of the things that we spend some time on like we think a lot about creating imagery and everything in terms of when we create a product. We’re always creating like a Facebook image at the same time. Steve: Okay, and then the landing page is just a page to join the crowd funding campaign? Kevin: Yeah exactly, it’s just a product page, sorry about that phone Steve, that won’t happen again. Steve: No it’s okay, it’ll get edited out. Interesting, okay so you have a bunch of these campaigns that just lead to a product page. Traditionally the way we have gone on Facebook as well because we take them to like a content landing page, where we either thoroughly describe our value proposition or do a freebie of some sort, but it sounds like you’ve had really good luck sending people directly to a product? Kevin: Yeah, and sometimes we don’t though, that’s – we kill our crowd funding products pretty frequently, so this is like the – our model is get it out there and see if it works, and then if it doesn’t let’s move on right away to something else. So it allows us to experiment, so yeah I mean there’s times when something just absolutely doesn’t work. And even though we might say we’re going to crowd fund it for 30 days, like if a couple of days have gone by, we spend a little bit of money on Facebook or we emailed it out to the customer base and they haven’t responded, we’ll just tell the few people that have ordered or maybe even no one has ordered, we’ll just say like, sorry this one had no traction, it was not going to hit the minimum, so we killed it now rather than have this like walking dead products on the site for 30 days. Steve: Okay, so let’s switch gears, you just mentioned email, do you have like your email list like segmented out by TV shows, and cartoons and what not? Kevin: Yeah we use Klaviyo. So there is all of our purchase history there, and we actually recently completed uploading old transactions in the Klaviyo. So now we actually can — if you ordered from us three years ago, and you ordered us a Spiderman shirt, then we can specifically target you based on that. Steve: Okay, and so whenever you release a new shirt let’s say it’s like a Spiderman shirt, you’ll just email everyone who has purchased a Spiderman shirt in the past? Kevin: Yeah, we try to keep it pretty relevant. We do send out blasts just probably like every other ecommerce company. But those would be less targeted more broad as opposed to like yeah the Spiderman example would be, hey — the subject line would probably say something about Spiderman, and they would specifically be for that product. Steve: So how much of your email marketing is automated versus broadcast? Kevin: Well it’s kind of like there is a mix between — so it’s not really broadcast whenever we do the Spiderman one, but it’s not automated either. So it’s like a segmented broadcast I guess you might want to describe it. Steve: Sure yeah that’s what I meant. So do you send those out — so outside of sending those out when you have a new product, do you have like a monthly broadcast that you do? Kevin: It’s weekly, we try to do at least one yeah. Steve: Okay what does one of those email sound like? Kevin: A lot of times they are based on a forum and it just looks the same. And it’s just an overview of all of the crowd funds that we’ve released. But then every once in a while if we have a special offer or a discount that’s what we’ll post, but basically we don’t email out like, hey don’t forget about us random generic emails. There is always some kind of offer in the email. Steve: Okay interesting, so most of your campaigns are not automated then? Like when someone purchases like a he-men t-shirt, they don’t have like a he-men specific sequence? Kevin: No, that’s really good idea though. Steve: Oh gosh that’s interesting, yeah true it is. Kevin: It’s awesome, it would take us forever to build, but I can see some value there. Steve: Or like your best ones like your Star Wars shirts or something like that. Yeah people would eat that stuff up I would think. So do you do any Pinterest work? Kevin: We do, and I have never been able to get Pinterest to work consistently. I have had occasional blips of success where I get excited. Kevin: I have never been able to keep it running. Steve: Okay. So I was just — part of what I do whenever I interview someone is I do the ACM [ph] rush, and I go through their site and see what’s going on. And you guys rank really well in Google for a lot of really hard keyword terms which is pretty amazing. And I know you guys have been around for a long time, but is there anything specific that you do to rank for these keywords? Steve: So is that the tip for everyone use Frontpage? Kevin: Well maybe the tip is I have no idea what you are doing with the database, because I didn’t. So my page is entirely folder based, and it was entirely hand generated html. And well with data Frontpage of course. But so what I had to do was I had to categorize these pages, so I knew how to find them easily. So I ended up creating like a folder in Frontpage that was 80s cartoons. And then where do I put the transformer shirts, so I put the transformers page and I used cartoon folder. And then on the transformers page is where all these specific transformer shirts end up, but what it ended up was human readable file structure. And I think that was probably one of the biggest things is that the file structure look great, whereas everyone else that was trying to have like a database driven site, their URLs just look like the gobbledygook. And obviously nowadays no one looks like that anymore right, like that’s in the past. But I just feel like by having such a strong start at it, we’ve just managed to continue on the same pace. And I’ll be honest with you I don’t do a leak of what most people might call SEO work. Like I don’t pay anyone to build links, I don’t do outreach for links. And in fact I get really confused when I even think about doing that kind of stuff, because when I think of where can I get a link I can’t even think about of a place worthwhile because most of the blogs like their links disappear over time. And like everything is on social media nowadays. Steve: I’m going to have to disagree with you there Kevin, because I was looking at your link profile. It seems like you guys have done some contests that have gotten some pretty good links, do you guys still do those? Kevin: No, when was that? Steve: I don’t know, I was just looking at it. There were some really high domain strength sites that were linking to your site, because you had done some sort of giveaway or something like that. Kevin: It’s possible that I mean that might have been something way back when – but I’ll be honest I don’t think it moved the needle. Steve: Okay and you haven’t done any of that stuff since? Kevin: No, contests just get your people who want to join contests. Kevin: Yeah I get what you’re saying; yeah there is some value there. Steve: So if you were to — so of all those traffic sources that we just talked about, what would you say would be your top source, would it be SEO? Kevin: Yeah, I mean that’s definitely the majority of it. And that’s a little confusing now since Google hasn’t shared as many other keywords. And since we do have quite a bit of brand build up over time, so there are a lot people that literally just use the URL part of typing the 80stees, and is that technically a search? I guess so, but it’s really then just trying to get to us. Steve: Yeah I mean you guys have really established your brand at this point. From what it looks like you do get a lot of typing traffic for 80stees which is pretty awesome? Steve: How do you deal with like inventory and all the sizes? Like you have like eight sizes, the same type for every shirt, it sounds like a nightmare. Kevin: It is a nightmare. Yes straight up it is a nightmare, and that’s something that we are always working on trying to figure out how to do it better. The crowd funds are something that we try and kind of project like if during the crowd fund we sold a certain ratio of smalls, mediums, large, extra large, we are probably just try and project that same ratio into the future when we do place a print around the order. But you always end up having some kind of other stocks, so it’s just impossible to avoid if you keep stock. Steve: So how do you manage that? Do you have any special strategies for getting rid of the sizes that are unwanted and that sort of thing or? Kevin: We’re not too great at that, no actually. What we’ve been doing lately is if the product is something we like we will actually launch a re-crowd fund of it. So we might have say smalls and five XL on stock or whatever. And but we’ll still launch a crowd fund to hit a goal number which will allow us to sell all the sizes as well as give us a nice head start on our primal run. Steve: Interesting okay. Yeah that just sounds like it can get out of hand real quick unless you have like a really good backend to maintain inventory and projections and that sort of thing. Do you guys use any software, or is it all homegrown? Kevin: We are using an auto management system that I would not recommend to anyone I suppose, so I won’t mention it. But I think I would probably say the same thing about most auto management systems from what I have heard in different forums and stuff. But yeah we do have a lot of homegrown software that we’ve built, and it’s constantly in development and trying to make our job easier. Steve: Okay and in terms of vendors like let’s say someone else wants to sell t-shirts and not necessarily 80stees. Like where do you start when you want to find someone to sell your t-shirts? Kevin: Yeah I mean if you are talking like something that basically you are saying like you want to be a buyer of other people’s products and not do your own development at all, probably go to like Magic Apparel Trade Show in Las Vegas. Steve: Interesting okay. Like if I wanted to sell like NCWA T-shirts, is that like a huge can of worms? Kevin: You just have to find the right vendor that will work with you. The hard thing is going to be that like with sports stuff especially it’s all channel separated, so like you probably can’t just go buy NFL shirts if you want to sell them. You might have to have like a shoes store or some — there is going to be some level of authentic business that you already have in order for someone to even sell to you. Steve: Okay I see, and so like the larger the organization the more red tape you have to go through? Kevin: Yeah and really what it comes down to is the more the higher percentage of revenue that a business makes from apparel or licensed products in general the tougher it’s going to be. Steve: Okay, do you find yourself moving more towards like the print on demand model where you don’t have to carry the inventory, you just go to the vendor and say, I want a print like five shirts, so whenever you make a sale? Kevin: Yeah that’s — a lot of our vendors are going that route. So we are trying to work with them and do that more and more. The great thing about that model is there are no inventory. The terrible thing about that model it’s really not scalable, and it stinks at Christmas time, right? Because it’s great to say well I don’t have any inventory, but then on December 15th you have to stop taking orders, because you’ve literally exhausted your capability just shipping time. Whereas on December I’m not sure what day Christmas is this year, but like the last shipping day possible to go next day before Christmas most of my inventory would be available for sale, and could get there. Steve: Is there any quality difference between silk screen versus the printing — the different printing methods? Kevin: Yeah for sure. Silk screen is definitely the best. But the other print methods do have some advantages in terms of like the color blending and everything you can do is a lot easier with that model, but those prints tend not to last as well. One thing you can — if you hit the right design though you could purposefully just dress it. So if it washes out a little bit then it might actually even be okay. Steve: So do people copy your stuff? Steve: Start with Chinese people, yeah. So but well can you do anything about it? Kevin: On Amazon I suppose you could, but it’s like Wykamol, it would be a pointless game to play. And if it’s something that we’ve made for one of our licenses we will ask them to send us cease and desist, but it’s even a little bit tricky for us, because we can come up with our own unique transformers design, but we don’t actually own the rights, so it’s not like I can really police that I have to get Hasbro to do that for us. Steve: Okay, I’m just curious because it seems like I can go on your site and I’ll see a shirt for like 18 bucks, but then hey I’m walking through the mall and I’ll see something for like 10 bucks right. And so do you even bother trying to fight those things, or you just run your business? Kevin: Yeah, I just pretty much run the business. We are such a small cog in this machine that we don’t have the resources to do that. Steve: Okay, and then this brand that you’ve built up, is there anything special that you’ve done over the years to instill the fact that 80stees is the place that you need to go for t-shirts? Kevin: I mean I think it’s really just the concentrated collection of it. I mean you can find a lot of products that we sell other places like Amazon or Target or whatever, but you are not going to find as many at a physical store for sure. Like as many wrestler wrestling shirts or transformer shirts. And if you go on Amazon you might find that, but they are just not concentrating at that niche level like we are. So it would be a little bit harder to navigate at the very least. Steve: Actually that was my next question; do you guys sell on Amazon at all? Kevin: We do sell a little bit on Amazon; it’s not a focal point for us due to all the counterfeiters who will come from an unnamed country. Steve: Plus they charge a lot of fees, right? Is it generally pretty profitable to be selling on Amazon, like if you could, let’s say there were no copy cats? Kevin: Yes, so we do merchant fulfilled to avoid the FBA fee as well as tax implications, but that 15% definitely takes a huge cut. Steve: Oh yeah for sure okay. So yeah, so it doesn’t sound like Amazon would be that great of a channel regardless, because of just the nature of how many fees that they take. Kevin: Yeah, I have competitors though that I mean they do all the Amazon things that you need to do to be successful. They are investigating which products have the best seller ranks and they are doing the FBA. And I feel like they are spending $10 in inventory to make a dollar after the end of the transaction. But I guess they are doing enough transactions that they think it’s worthwhile and since the FBA model have low overhead they can justify that. So I wouldn’t say it’s impossible to make it work, because these companies probably would have gone out of business by now. Kevin: But it’s just not for us. Steve: Is there room for creativity in the t-shirts that you have? Like are you allowed to modify designs for your t-shirts? Like can I stick like [inaudible 00:44:49] on a t-shirt and make him say something funny? Kevin: Yeah to an extent. So we can be creative, and then we have to get it approved. So it’s — we do run in some of that where we think we have an awesome idea, and it just doesn’t fit like the brand. They are like well this is — they are literally called like off brand, this is off the brand message, so we can’t do this. Steve: Okay, what’s funny about this is I get a lot of emails from people who actually want to sell t-shirts or some sort of printed shirt. Do you have any just advice for those people on just getting started in the t-shirt business? Kevin: Just getting started. I mean honestly if I wasn’t — if I didn’t already have the resources and stuff that I have, I would pick a different industry, and apply my knowledge there. It just so happens that we are making it work because of the head start. But yeah I would say the thing to do would be to have a [inaudible 00:45:48] of your brand as opposed to like be the prevue of funny graphics shirts right? Because that’s just — there is a million of them. Steve: That sounds like a nightmare. Steve: I mean I like your niche because 80stees, I actually did some searches for 80stees on Google just to see what the other — what your competition was like. And it seems like you have the largest collection, from what I could tell at least. Kevin: Yeah I mean we definitely try to be that way too, and we literally look at it like we have to have coverage of a specific category. So like with super Mario we’ve got to have the super Mario two and the super Mario three shirts, because those were also released in the 80s that type of thing. Steve: Yeah for sure. Cool man, well that’s really interesting. I always wonder how business owners in pretty competitive industries manage to make it work. And it sounds like you found like a really good niche that’s really profitable that you’ve made it work. So thanks for your insights Kev. If anyone can find you who wants to ask you any more questions about the t-shirt business, or if they want to buy some 80stees, where can they find you? Kevin: Well the domain starts at 80stees for the actual site. And then I’m going to have a site up at Kevinstecko.com if anyone wants to just personally get in touch with me. Steve: Cool, I actually did not know about that site, I’ll have to check it out. Kevin: It doesn’t exist as of the time we are talking, but it will. Steve: Okay all right, it will be up by the time I publish this? Steve: Cool well thanks Kev, thanks for coming to the show man, I really appreciate it. Kevin: All right man, thanks Steve, take care, bye, bye. Hope you enjoyed that episode. If you remember I had another guest on the show Derek Pankaew to talk about his t-shirt business, and it’s just interesting to compare Kevin stories with his, because they operate completely differently. For more information about this episode, go to mywifequitherjob.com/episode139. Once again I want to thank sitelock.com for sponsoring this episode. If you have an e-commerce store, go there right now, and find out how long it takes to load. Does it take more than five seconds? If so did you know that 60% of consumers only wait up to five seconds before bouncing from a site, never making a purchase? And did you know that at least 68% of shoppers do not return to poorly performing websites. These are huge percentages, and they mean lost revenue and reputation damage for your business. Now with SiteLock’s Truespeed, a state of the art global content delivery network, they can improve your website speed 50% on average, and reduce bandwidth by up to 40% to 70%. For more details on how you can speed up your website, go to sitelock.com/mywifequitherjob, and get your first three months free. Once again that’s sitelock.com/mywifequitherjob. Great podcast! I have a question to Kevin about his Robotech license, is that license only from Harmony Gold (copyright holder), and not from Big West/Satelight (Japanese property owner)? I would like to know on how many people you would need to ask, especially when it comes to online and international sales? This episode was very helpful to us as we launch our shirt business.